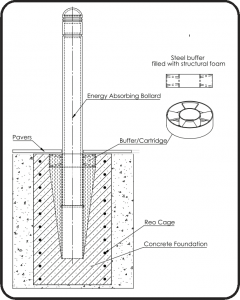 Why use Energy Absorbing Bollards (EAB)? Energy Absorbing Bollards also known as EAB’s are designed to SAVE LIVES and proven by their rigorous testing during development (See the crash test video below). With events like the 2017 Melbourne car attack, a crash tested bollard with a proven impact rating could severely reduce or prevent such incidents in public spaces without compromising pedestrian access and aesthetics like concrete barriers. Energy Absorbing Bollards are the only Crash tested bollard in Australia! 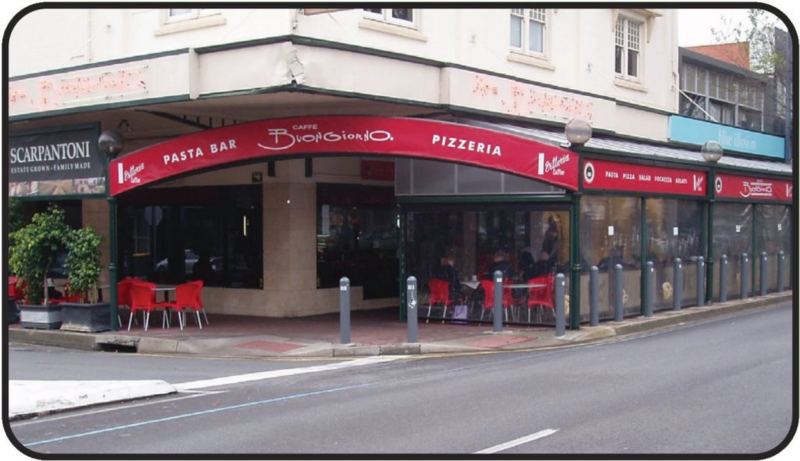 Proven levels of crash protection for road-side diners, pedestrians and assets. Avoids serious injury or death to the occupants of the errant vehicle. What advantage do EAB’s have over other bollards? Energy Absorbing Bollards (EAB’s) are the only crash tested bollard on the market! 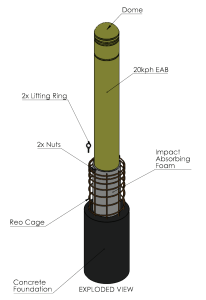 EAB’s are a non-gating energy absorbing bollard. On impact the unique cartridge system absorbs energy and decelerates the vehicle bringing the vehicle to a steady and controlled stop. Thereby protecting both the pedestrians and the vehicle occupant. EAB’s are specially designed to significantly reduce the risk of injury and fatalities to the occupants of the vehicle due to its specially designed crash impact system safely decelerating the vehicle and its occupants while maintaining its crash rating. The EAB20 also has a small in-ground profile compared to the EAB60 making it great for installation into areas where pre-existing services may exist at lower depths. EAB’s can also be found in many other zones where pedestrians are exposed to live road traffic. Where do Energy Absorbing Bollards get used? Energy Absorbing Bollard Crash Test. Footage from a crash test performed of the Energy Absorbing Bollard by ASE.